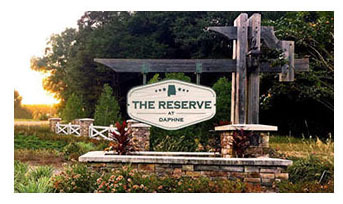 Already own a home in the The Reserve at Daphne? Thinking of selling? Click here and read about current search trends & our web network. The Reserve at Daphne is a new residential community developed by renown builder by DR Horton. One of Daphne's newest subdivisions, The Reserve is located on Co Rd 64 just east of Hwy 181. Residents will have access to great amenities including a resort-style pool and the only subdivision in Daphne to boast a lazy river. The development offers 6 floor plan choices with homes ranging from 2,091 square feet to 3,047 square feet of living area. All residences will showcase a craftsman stye look with exteriors of houses finished in brick and some featuring hardi-board fronts. These homes are constructed to Golf Fortified standards allowing buyers to receive a major discount on insurance costs. More. Interiors of homes will be outfitted with large kitchens & center islands, granite counters, stainless steel appliances, and soft-close drawers and cabinets. Floors will have luxury vinyl plank throughout the main areas and plush carpets in bedrooms. The Reserve at Daphne is a great neighborhood for families and is within close reach to schools, shopping centers, restaurants, golf courses, and local attractions. Popular entertainment venues, like OWA amusement park, and public beaches of Gulf Shores are about an hour drive from the community. If you would like to schedule a private viewing, need more information, or have questions concerning the The Reserve at Daphne or any other property, please email info@condoinvestment.com or call 251.Area.Pro (251-273-2776) for immediate assistance.